LITTLE ROCK, AR--(Marketwire - May 2, 2008) - Michelle Duggar, mother of 17 beautiful children, and Dad, Jim Bob Duggar, will celebrate a ducky Mother's Day Sunday, May 11, at 11:00 am at The Peabody Little Rock. All seventeen children will be there as Honorary Duck Masters. 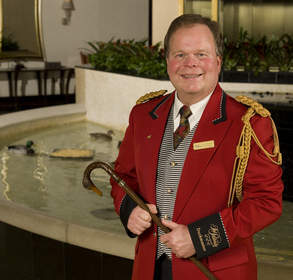 Michelle Duggar -- mother to Joshua, Jana, John-David, Jill, Jessa, Jinger, Joseph, Josiah, Joy-Anna, Jedidiah, Jeremiah, Jason, James, Justin, Jackson, Johannah and Jennifer -- will be given a special Mother's Day welcome by the Peabody Ducks and Duck Master Lloyd Withrow. "This is the first time in the history of Peabody Hotels that such a duck march has taken place," said Withrow. "It will be a wonderful celebration of motherhood for all to enjoy and a great Kodak Moment." Following the Duggar March of The Peabody Ducks, the family will enjoy the legendary Peabody Mother's Day Brunch, prepared by André Poirot, executive chef of The Peabody Little Rock, and his entire culinary team. water park in Hot Springs, Ark. For more information, contact Becca Gardner, CJRW PR Agency, Little Rock, at 501-975-7230, or becca.gardner@cjrw.com. The Peabody Little Rock is a Four-Diamond, Wine Spectator Award of Excellence property of Peabody Hotels within the portfolio of Peabody Hotel Group.